This verse features the literary ornament (alankara) known as vyaja-stutih wherein affection is expressed through criticism. The use of the negative to convey the positive is a rhetorical tool used in many traditions. In English, for example, the beauty of a diva may be described as devastating. Or the applause after a brilliant speech may be called deafening. In expressing its veiled praise, this verse plays with the theme of milk – of seeking cow’s milk and losing mother’s milk. 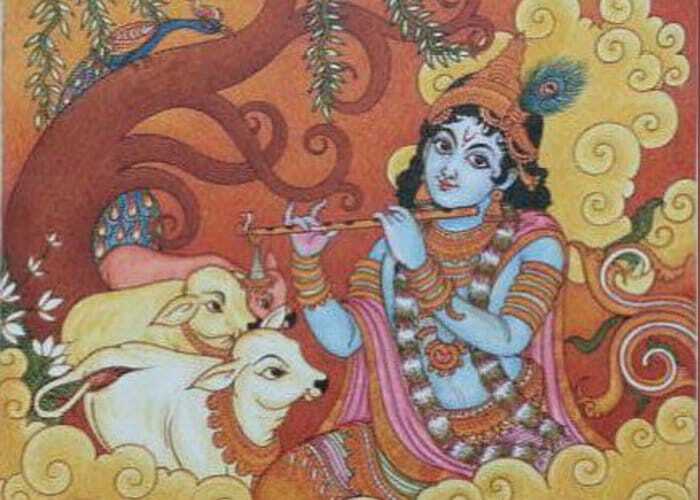 Krishna is celebrated as Gopala, the protector of innumerable cows. Cows supply milk, which is nutritious, delicious and precious. If we want wealth in the form of milk, we may naturally seek it by approaching the Lord of the cows. Therein, the verse declares, lies the surprising twist. Approaching him and becoming attracted to him has an unexpected result: we lose even our mother’s milk. For a newborn, mother’s milk is immensely nourishing and satisfying; being deprived of it is a great loss. That privation is the negative used to poetically convey the supreme positivity of liberation – those who become attracted to Krishna don’t take birth again and so don’t need mother’s milk. When we approach Krishna, his supreme attractiveness captivates us, especially if we approach him by associating with devotees and therein absorb their devotional mood. That devotional attraction grants us access to his supreme sweetness. When we relish that taste, our consciousness becomes increasingly elevated above mundane attractions and ultimately becomes liberated from the material world itself. Once we are freed from matter, we no longer need the mother’s milk that is necessary when we enter into a new body. Thus, the verse that seems to be a lament of deprivation is actually a celebration of liberation. Similar verses that convey the positive through the negative are found in several other poetic compositions glorifying Krishna. One celebrated example is the Chauragraganya-ashtakam (eight verses in praise of the foremost of all thieves). In this endearing work, the great poet-saint Bilvamangala Thakura glorifies the supreme as the supreme thief. Its third verse declares Krishna to be such a deadly thief that he not only steals our home and leaves us on the streets, but also steals our knowledge of where to go when we are on the streets. Making us both homeless and pathless, he plunders us of everything. Significantly however, when we are left with nothing, our heart becomes fully empty for Krishna to fully fill. Thus, he becomes our only possession – and he, being the Lord of the goddess of fortune, is worth far more than any other possession. The last two verses extend the mood of glorifying by apparently criticizing to the theme of possessing Krishna. They declare that the impoverished devotee catches the thieving Lord, locks him in the prison of the heart and keeps him there forever. The devotee becomes eternally and supremely enriched. How is Krishna caught in the prison of the heart? By the noose of devotion, as the fifth verse states. Only by our sincere desire to lovingly serve him does his indwelling presence become manifest and stay manifest. Another similar verse that praises by criticizing is found in the Bhakti Rasamrita Sindhu (1.2.239) by Rupa Goswami. Therein, he depicts one gopi forbidding another gopi from going to the banks of the Yamuna and beholding the charming form of Govinda, lest she lose her capacity to enjoy life’s materialistic pleasures. The implication is that the sight of Krishna is so captivating that it makes us forget all mundane pleasures. Thus, what is being forbidden is actually being recommended. Mysterious indeed are the ways of divine love. Therein, proscription is prescription, reprobation is glorification, the worst loss is the best gain, and the supreme robber is the supreme rewarder. Hare Krishna Chaitanya Charan Prabhuji, \\”Aapne is article se hame ghayal kar diya\\”. This article is really devotionally enriching. You have touched this topic of vyaja-stutih in your lecture \\”How Krishna steals our distresses\\” dated March 31, 2018, Congregation program at Laguna Beach, USA. Humble request as you conducted the seminar \\”Holy name is everything\\” in Australia please conduct the entire seminar on Chauragraganya-ashtak .